You can have a democratic say in what we do and how we function – you just need to join and attend our conference on December 8th. Another Europe is Possible conference is on Saturday 8 December 2018, from 10.30am, at Birkbeck College, London. Final agenda and papers here. On December 8th at Birkbeck, London, Another Europe is Possible will hold its first ever members’ conference. At this conference, we will democratically agree our strategy and our internal democracy. To take part, you need to be a member – you can join right here for as little as £1 per month and register. Conference agenda can be found here. Below are the two proposed documents. You can also download them as PDFs here and here. A report of activities will also be circulated to members prior to the conference. All members can propose amendments to these two documents. The deadline for amendments is 12 noon on Thursday 6th December. These should be sent to info@anothereurope.org and will need a proposer and a seconder. Another Europe’s strategy and activities are guided by our aims and principles, which are a part of our constitution. This document is designed as a broad overview of our strategy, and does not include every planned activity. However, if members wish to put forward proposals for specific activities they are free to do so. Brexit is a project whose aim is to deregulate the economy, undermine rights and protections, and end free movement. It is an attack on public services, the NHS, working class people and the communities which the left is supposed to represent. It is build on a narrative of racist scapegoating, and it legitimises right wing narratives on migration and nationalism. The British people voted to leave the EU in 2016. We do not write off all those who voted Leave, or believe that they are all racists, though we must not fall into the trap of denying the role played by racist attitudes and anti-immigration rhetoric. But we disagree with this decision, and we challenge both the final legitimacy of the vote and the idea that there is any mandate for any particular form of Brexit. In a democratic society, we have the collective right to change our minds and persuade others. We assert that right, and demand a referendum on the terms of the negotiated deal – or no deal, if that is what we are left with – with an option to remain in the EU. The vote on Theresa May’s Brexit deal will be put to a vote of MPs on Tuesday December 11th. It is likely that it will fall, and that the political crisis will intensify. The voting down of the government’s deal marks an important point in our strategy. The defeat of the deal will open up a space in which either a general election or a fresh referendum are very likely. It may be necessary to extend Article 50 in order to do either of these. While we are a proudly cross-party campaign, we understand that the position of the Labour Party will remain pivotal. We have already had a great deal of success in this. While we did not get everything we wanted, our unprecedented campaign in the run up to Labour conference established a sequential logic in Labour policy which is now playing out: to vote against the deal, to demand an election, and to then keep all options on the table including a public vote. Shifting Labour is not just the work of Labour members. The work done by other parties, for instance the Green Party, has been important in pushing Labour forwards. Our aim now is to ensure that, whatever happens next, the people get the final say. In the event that a general election happens, we will fight tooth and nail to ensure that there is a majority in the new parliament in favour of calling a referendum. Practically speaking, this means campaigning for Labour to have a manifesto commitment to one, and campaigning against the Tories (in the same way that we did in 2017). Assuming that the deal falls and there is no election, a likelihood given the Fixed Term Parliament Act we will continue and escalate our public campaign for a fresh referendum. We need to convince MPs, but our strategy is not just about lobbying. We need bottom-up pressure from constituents, from within the labour movement and from public opinion. 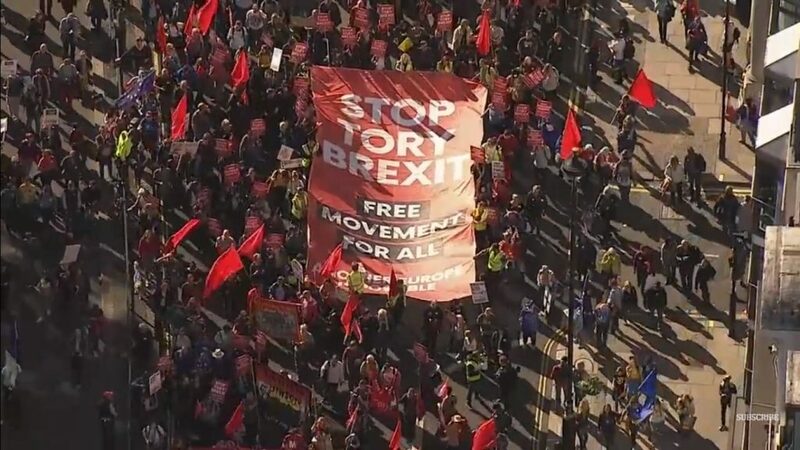 As well as conventional and digital campaigns and a press strategy, we need to continue the campaign of protests, marches and stunts, and push the anti-Brexit movement to escalate towards direct action and civil disobedience. Another Europe is in a unique position to deliver this. If any Brexit deal passes, Brexit becomes extremely likely. Our only hope for success in these circumstances would be to create a crisis from the outside of the political bubble. We would have to be part of a movement that brought down the government, or which made the country so ungovernable that the government went back to the people. For now, it is unlikely that the deal will pass – but we will remain alert to one being proposed again. Throughout this process, we will also work on an understanding and using procedural levers in Westminster and in the EU. We recognise that we are not the campaign with the most knowledge of parliamentary process, and it makes little sense for us to lead on all of this work. But we will make sure that everyone – at every level of our campaign and in the wider movement – understands what we are doing and why. We will attempt to demystify the process. Another Europe is part of the wider progressive left. It is also part of a growing and distinct anti-Brexit movement which has grown substantially in recent months. 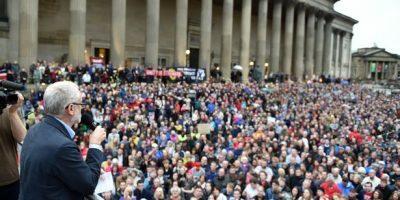 The 700,000-strong demonstration on October 20th was the biggest in the UK since the Iraq War period. 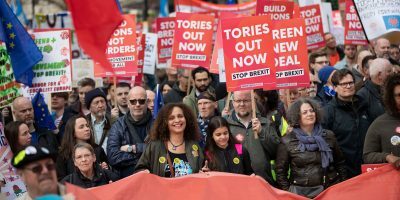 While the leadership of the much of the anti-Brexit movement might be dominated by the political establishment, its mass base is hugely diverse both politically and demographically, and it is essential that have a strategy to interact with it. We do not aim to set out a fully developed perspective on the anti-Brexit movement – which is diverse, complex and contradictory – here. We will aim to improve on our understanding of it in due course. We will continue to relate to the wider movement, including at its marches and meetings, and by building alliances at a local level. It is increasingly likely that we will end up fighting a new referendum on Brexit. In this scenario, we would work flat out to win the vote, and to do so with our own progressive vision for Britain and Europe front and centre. This means foregrounding our support for workers’ rights, environmental protections, human rights, free movement and a broader internationalist politics – not focussing abstract economic arguments. We will make the case that keeping Britain in the EU, or defeating the government’s deal, is part of a strategy for transforming society, not the status quo. We want to use the referendum campaign to win a public argument on a deeper level, and the profile of our arguments in the general campaign will boost the anti-Brexit vote across the board. Strategically, we will focus on voters and demographics where our messages resonate most, and where they will make the most difference. This means campaigning among working class voters, especially Labour-voting Leave voters. It also means a drive for turnout from anti-Brexit strongholds in the previous referendum, both demographically and geographically. Regardless of any attempt to form the designated campaign, we will reach out to form formal and informal alliances with the Green Party, Labour, Momentum, trade unions, NGOs and grassroots campaigns. In 2016, a large proportion of the legitimate electorate was disenfranchised. 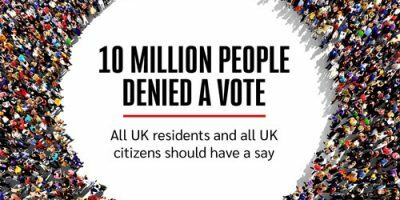 We support the right of all residents of the UK to vote in any referendum, as well as all UK residents living abroad and anyone over the age of 16. The going ahead of Brexit would represent a defeat for the progressive left and for ordinary people in Britain and across Europe. It will almost certainly mean a loss of rights and prosperity, especially for the poorest in society and for migrants. It will strengthen the narratives and mobilisations of the far right. And it will have an international effect in the fragmentation of Europe and the emboldening of a global resurgence of aggressive nationalist and racist politics. Under these circumstances – which we believe are more than avoidable but for which we must nonetheless prepare – Another Europe would seek to play a critical role in bringing together the progressive left for what happens next. This would include a deliberate attempt to coalesce those parts of the grassroots of the anti-Brexit movement who agree with our aims. Not only to resist any further deterioration in workers’ rights, environmental standards and human rights, but also to campaign for the UK to match further improvement EU measures and exceed them. To campaign for a serious internationalist perspective, and to provide spaces to build this. We will continue to work with with socialist, green, social democratic and other progressive political forces across the EU to seek fundamental democratic change in the EU’s constitution and decision making process. To support the self-determination of the Scottish and Irish peoples, by supporting their right to a referendum on independence and unification respectively. We will continue our fight for a new, different better Europe, working closely with European Alternatives with whom we reaffirm our affiliation. We will work for the renewal and transformation of the European institutions. Key priorities for reform efforts in the period ahead are: reigning in the power of multinational corporations through tougher regulation, higher (and coordinated) corporation tax at the EU level, and clamping down on systemic tax evasion; creating a humanitarian system for refugee and migrant settlement, ending the policy of fortress Europe; strengthening digital rights for workers and consumers; leveling up standards for labour and the environment across Europe, including clamping down on the precarious ‘zero hour contract’ economy; pioneering a new economy, transforming the Eurozone, ending austerity, introducing a ‘new deal for Europe’, and also creating new forms of economic ownership, which allow for democratic control by workers, service users and the public. Campaigning for the British left to have a serious internationalist perspective, and to provide it with spaces to build this. Participating in and improving on a debate within the broad European left about if an how we can transform the EU, developing a realistic strategy within the institutions of the Union and its connected national governments. Alongside internal reforms to the current EU migration system, to campaign for a new coordinated strategy designed to tackle the root causes of migration in which western states have some significant historic responsibility. Another Europe is Possible was founded to fight the 2016 EU referendum campaign from a left wing Remain perspective. Since then, the need for our existence and the scope of our activities have only grown. We stand for a society run in the interests of people and the planet. We stand for an open society and a pluralist politics. We believe in the power of ordinary people and workers coming together to win a better life for everyone. The power to win a better society is in our hands. At the same time, we will fight for the legal protections for the environment, workers, migrants and human rights provided by EU membership. We will campaign to retain and extend all of these. We will fight against the racism, hate, border controls and right wing nationalism that have come alongside the Brexit moment, and which are part of a wider moment of far right resurgence. We aim to be a space for those parts of the progressive left who share our perspective to come together, cutting across party lines. The struggle to win gains for ordinary people, and to democratise the European project, is our struggle. We will not shrink from criticising and opposing those policies and structures within the EU which cut against our progressive vision. We are for solidarity between people and across borders. 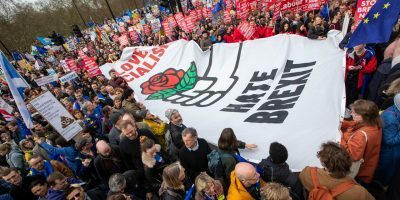 We want the progressive left in Britain to be internationalist, and to build links of solidarity and cooperation with the left across Europe and beyond. 2.2 Membership is open to all those who broadly agree with our statement of aims and principles. 3.2.4. The National Committee may delegate to working groups, project boards and sub-committees at its discretion, comprised of members of the National Committee and any other member of Another Europe. 3.2.5. The National Committee will meet roughly every month, at its own discretion. Members of the Committee may attend in person or via phone, Skype or any other reasonable mechanism. 3.2.6. If there are more affiliates on the committee or voting in any given instance, than elected members, any votes taken will ensure that elected members have at least 50% of the total voting power. 4.2. Staff employed by Another Europe are expected to faithfully implement the policy and strategy of the organisation. 4.3. Staff may not exercise a vote on any Committee of Another Europe, but are free to vote as members (if they are members) at National Conference and in internal elections. 4.4. Staff must remain outwardly neutral on all internal elections and will not use the resources of the organisation to promote any candidate over another. 4.5. Staff will be treated with decency and dignity at all times by members and elected officers of Another Europe; will never be paid less than a living wage; and will have their trade union recognised. 4.6. 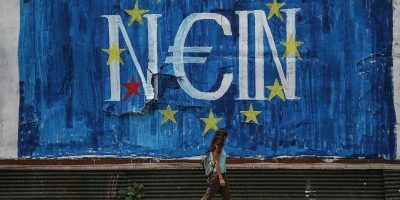 Another Europe may also pay people on a freelance basis to do tasks. These people are not staff for the purposes of these rules, but will not use any access to data or resources to give them undue advantage or influence. 5.1. The National Organiser (or most senior staff member), or their appointee, will act as the Returning Officer in all of Another Europe’s elections. 6.1. Members – and supporters – of Another Europe are encouraged to organise together autonomously from (but supported by) the staff and committees of the organisation in local groups and informal networks. 6.2. Another Europe will, where agreed by National Conference or the National Committee, facilitate formal networks of members to deal with specific issues or areas of work. 6.3. Members will have the ability to communicate horizontally with one another via an online forum. 7.1. The National Committee is responsible for drawing up and agreeing a full Code of Conduct and Disciplinary Procedure which it will provisionally approve and then present to conference in 2019. 7.2. Another Europe reserves the right to exclude those from membership whose behaviour or beliefs are opposed to its values, via a process approved by the National Committee. 7.3. Any member who is accused of any offense will have the right to a fair hearing in line with the rules of natural justice, and will have the right an impartial appeal, via a process approved by the National Committee. 8.1. Any organisation which shares the aims and principles of Another Europe may apply to affiliate. 8.2. The National Committee will decide on the application of any prospective affiliate. 8.3. National Conference may ultimately decide on affiliation decisions in cases where the National Committee’s decision is contested. 8.4. The basic affiliation fee for an organisation is £200. The National Committee may at its discretion waive part or all of this fee. 8.5 Any local group, party unit, union branch or other relevant local organisation may also affiliate to Another Europe. They will receive special attention and support from staff and the National Committee, and regular materials and contact. They are expected to send at least one representative to national conference, and are asked to pay a donation of £50.